Food writer Hugh Fearnley-Whittingstall wrote about this simple and delicious idea a couple of weeks back. 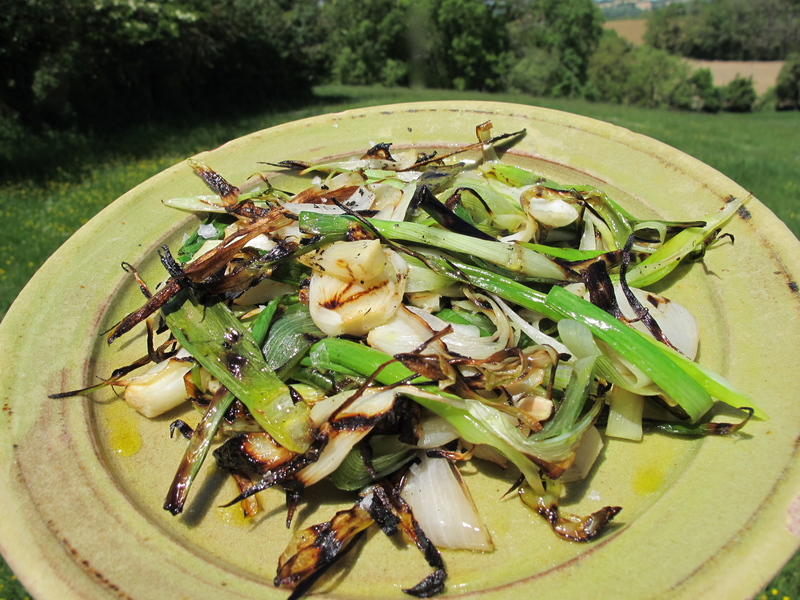 Not easy to use up all the spring onions/scallions in a bunch and this makes handy use of the stragglers in the fridge. How many you do depends on the size of your grill–a bunch at a time on an average grill perhaps. A warning though–once you start eating them it’s hard to stop picking at the pile on the serving plate. Heat an iron grill pad gently to hot. Slice the onions lengthwise fairly thinly–taking care not to include a finger in the process. 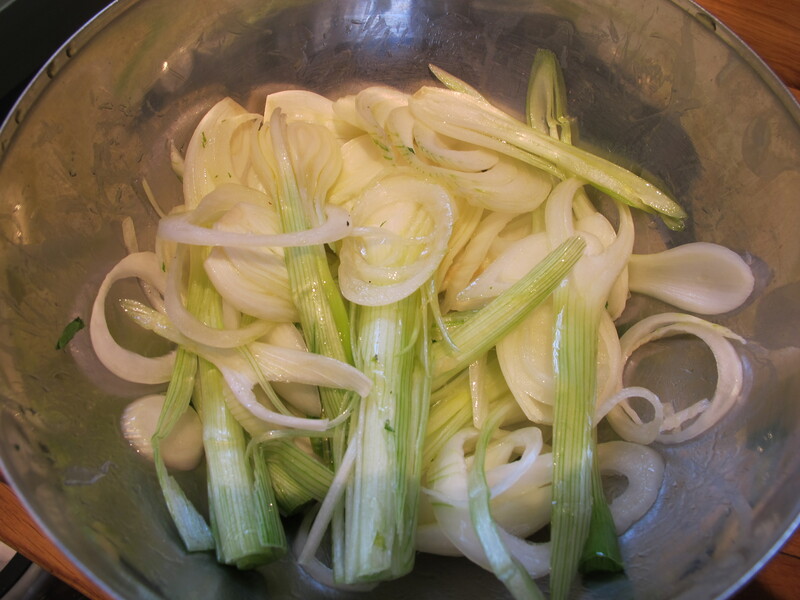 Put them in a bowl and add the tablespoon of olive oil. Turn the onions over in the oil to coat them nicely. 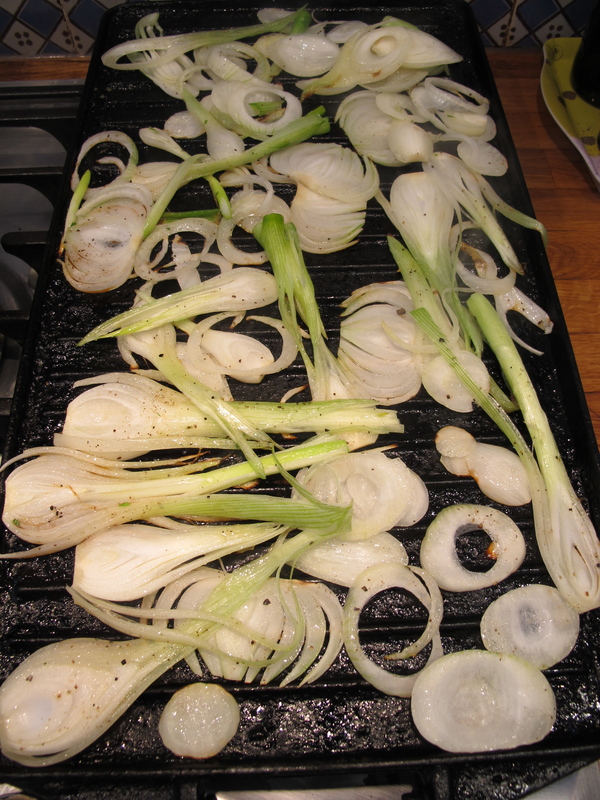 When the pad is hot, tip the onions over it and spread them out evenly so they all get a chance to char a little. Turn them and rearrange them as they color up and soften. 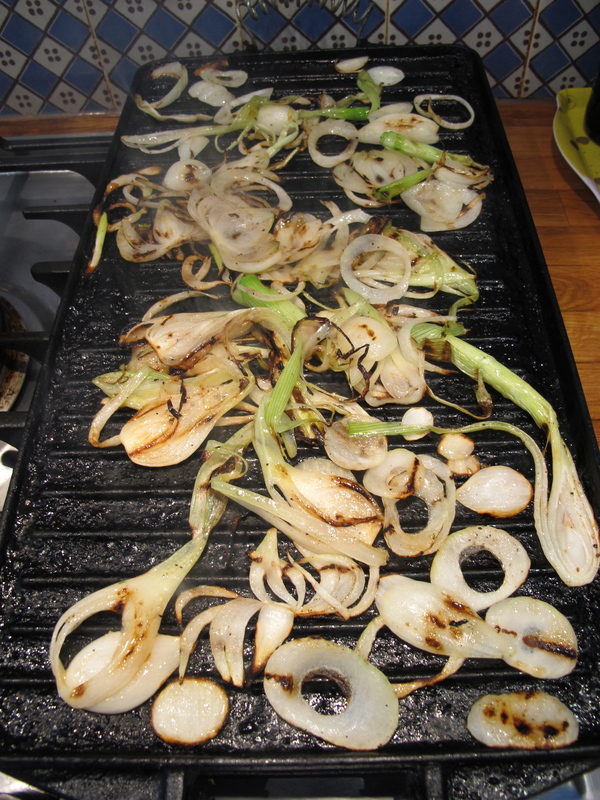 About five to seven minutes should do it but it depends on the grill and how many onions you are cooking at one go. Transfer the onions back to the bowl, sprinkle with salt and pepper, a little more olive oil and the squeeze of lemon juice. Oh you look much better…& your lunch looks delicious. With the dappled sunlight (great shot, Meredith!) it seems like late spring heaven! Will definitely be making this. have a lovely weekend, both. 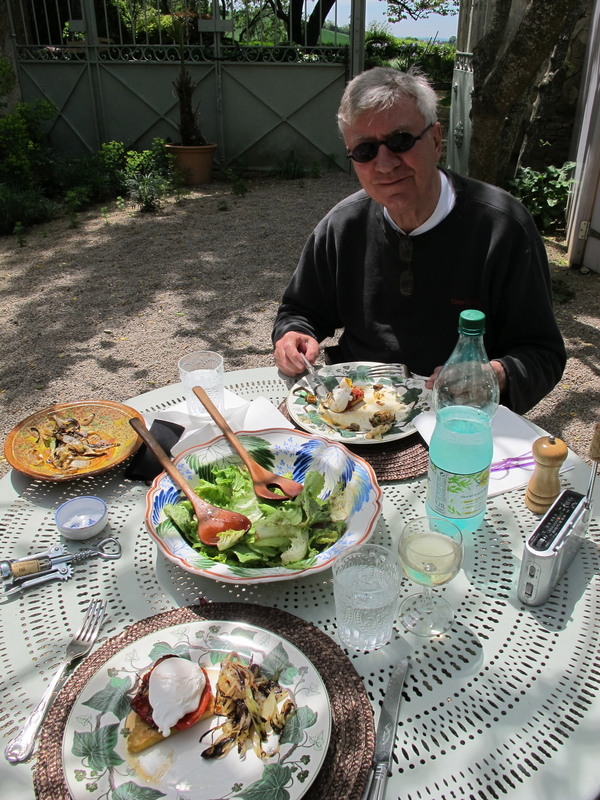 Ps You were (I’ sure) quite right about Sophie D knowing one grandfather better than the other – I am just envious of her!! You know I’ve never had a poached egg. Are they good? Are they hard to cook? Bring a small saucepan of water to a gentle boil. Add a splash of vinegar. Break the egg into a cup or glass and then add it carefully to the water. It will take a couple of minutes. Fish it out with a slotted spoon–draining the water off and you have a poached egg! on May 12, 2012 at 12:16 am | Reply Dianne P.
“What a long, strange trip it’s been!” You came to mind tonight when the Grateful Dead came on the radio tonight…then I came home to find this lovely post! Cheers & hugs to you both! 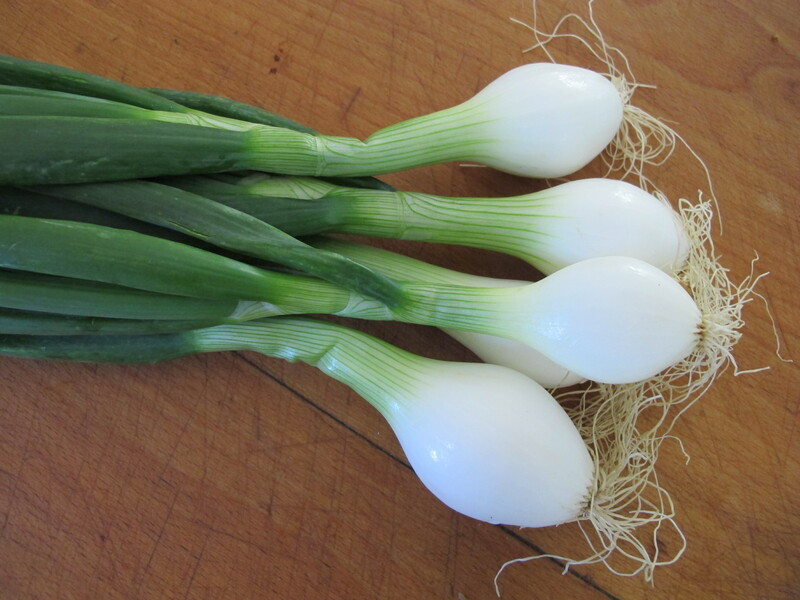 Now these spring onions – scallions prepared a la Robin would be absolutely delicious cooked outdoors on an Aussie barbeque plate. Imagine the smell! I can almost whiff it in the air. What a brilliant idea! Mon ami, je vous remercie mille fois… and wish you both a very happy sunny weekend. Mr. Ellis, can I just ask you whether truffles are still used in French cooking? I used to like the taste of them in garlic sausage. I know that pigs are used to sniff them out under the earth. Have you ever used truffles in your cooking?? OH, I don’t mean chocolate truffles but the black ones like mushrooms. They are much prized and sought after in France and the places they can be found are jealousy guarded secrets. They can be worth serious money. Yes, I thought so. Years ago, I heard that truffles were worth more than gold in Paris. Pity because they taste nice! I’m so glad you’re feeling better and enjoying the lovely spring weather.